My favorite character, Kit Marlowe, has at our interviewer…. Name (s) Christopher Marlowe, Kit Marlowe, Marley, Morley. Age (before death and after you ended up in HSM’s domain). I was twenty-nine when murdered. I’ve been in Hell since 1593 A.D. How many years is that? Time in hell is impossible to gauge. I was killed on a Wednesday, May 30, supposedly for my heretical beliefs, but more for my spying. A man had to make a living in those days. Please tell us a little about yourself. I was a good friend of William Shakespeare, and still am. We wrote plays and more together, and still do. I was killed at the behest of a woman jealous of her husband’s regard for me, but the reason given was my ‘vile heretical concepts,’ although the wittol who stabbed me in the eye could barely read. I was then in Sir Francis Walsingham’s intelligence service, and called to answer questions by Privy Council. Someone didn’t want to hear the answers. Who were you in life? A famous poet, a playwright, a spy, a rakehell, a lover of pleasure — boys and girls, men and women — and the sound of words in my ears. And still am all of those. How do you think you ended up in Hell? ’Tis said I am in hell for writing these lines in my Dr. Faustus: “Hell is just a frame of mind.” Or so Satan tells me. Describe your appearance in 10 words or less. I look as I looked when I died: young, fetching. Where do you live in Hell? Tell us about your residence and area. I live wherever Will Shakespeare lives, these days, in New Hell or Pandemonium, behind the devil’s own theatre, if we’re not playing at the Old Rogue Theatre in New Hell. When in New Hell I have as many beds as I have fingers, but since Will I leave them cold and lonely. … and so sprang I, full formed from Satan’s breast like all the rest of these souls come home to roost. Would you kill for those you love? After all sending someone to the Undertaker is not very nice! I’ve killed for less. I’d kill for Will Shakespeare, for that soul above all others whom I love. In life I cared for nothing but my writing and my pleasure… and a bit of ‘who’s your father’ wherever I could find it. Would you die for those you love? Die, being a relative term…. Death in Hell, like death on earth, is overrated. I’d die a thousand deaths to save Will, or any other so unfortunate to have me as a lover. But I’d die first for my work, for my honor, for my heart – and did, in life. Do you have any phobias? Are you plagued by anything particular in Hell? Phobias? My heart is fixed on one soul alone, and that soul is my gravest weakness. I don’t want to lose track of Will Shakespeare, now that I’ve found him again. To protect that tender soul from Satan is worth more to m now than protecting all of England from her foes was when I breathed a poet’s air in life. What do you think Satan’s most creative punishment is here? Ah, the Deceiver is clever. He holds out blandishments to the souls he wants to torture, and twists them here and leads them there, offers all and takes it back again between two heartbeats. He’s got the right job, that devil. Everything I thought became the devil best in Faustus only foreshadowed Satan’s wiles. Who are your friends here? You want a friend in hell, you say? Get a dog, if you can find one that’s not deathly rabid. Byron did – and says it’s really his dog Boatswain, not rabid now, never mind that this dog’s coal black and that in life his Boatswain was black and white. Will Shakespeare is my closest friend, a bosom friend, you’d say. Then Byron, who drags along behind us now and again. But friends in Hell are boils to be pricked and burst forth poison. They don’t last long. I have Will, but for the nonce, I fear. And without him, Hell will be without its single light of grace. Who are your enemies? My enemies? Abounding. Jealous louts, foolish intelligencers of Satan’s will; now add that whole crew from the Iliad, because we used a few skins of theirs in our plays. And Satan, I dare say, is my worst enemy of all, but so sly: the worst enemies are always those who pretend to be your friend. Every overreaching protagonist in my plays has his like in Hell, and I’m faced by every one of them. If I recall relationships are… difficult. Is this the side of humanity you miss the most? Once I said, and still believe, “All they that love not tobacco and boys are fools.” But in Hell, as I’ve been known to note, ‘boys are few and tobacco tainted.’ So I make do with whatever comes my way that’s an untainted slip for my boat. 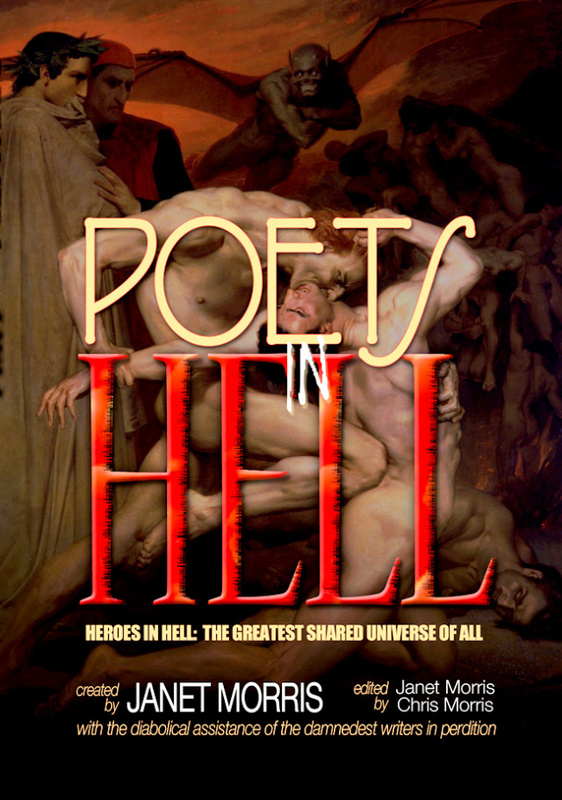 Making love in hell is a fool’s errand, leading straight to death and the Undertaker’s table. Harboring love in Hell is my greatest weakness now, as it is the downfall of any honest soul. But love I do, that mad and delicate Will Shakespeare, whom the Devil will pry away from me for pure amusement. That I know the truth makes living this farce not one whit less dire. Please give us an interesting and unusual fact about yourself. Will Shakespeare and I were born on the same day. While I lived, I raised blank verse to an art form; too bad my imitators couldn’t keep it there. I earned my way through school engaging in ‘matters touching on the benefit of my country.’ I wanted most of all to be an atheist, but that didn’t keep me from ending here. I got to hell by grabbing Ingram Frizer’s dagger whilst he was threatening me that day in Deptford at Eleanor Bull’s house. We struggled. The rest is a history much disputed. I didn’t die immediately after Frizer stabbed me in the eye, for I recall it well enough. And it hurt like very hell. Pick any story about me you wish. They’re all sure to be partly true. Name (s) Christopher Marlowe Kit Marlowe, Marley, Morley.